It’s the 22nd of October, and we are officially only nine days away from Halloween! So besides watching Hocus Pocus for the 500th time this season, or awaiting the premiere of The Chilling Adventures of Sabrina, what else should you do this week? Well let me tell you. The Chilling Adventures of Sabrina premieres on Netflix this Friday! We’ve got a costume contest here at the library, tomorrow evening (Tuesday the 23rd), from 5:30-7pm. And everyone is welcome to participate, especially teens! It’s $1 to enter, and all proceeds benefit the Friends of the Smith Public Library. So if you can’t wait till next week to break out your fabulous Halloween costume, come on down to SPL and win a prize for how awesome you look! You guys want to know something else? If you rearrange the letters SPL (Smith Public Library), you can get PSL (pumpkin spice latte) instead. Clearly, I am a genius. This is all I drink all fall. Anyway, everyone have a fabulous week! Don’t forget to get spooky and turn on some chilling tunes on Spotify. We’ll be jamming along here in the teen room right there with you. I just wanted to stop by and make a quick post to officially introduce myself. My name is Kelsey Sidwell, and I am your brand new teen librarian here at the Smith Public Library! Audrey and I are both excited about this new development, and she promises to stop by and visit the blog every now and then. So, a little background. I have been at SPL since 2011, when the new building opened and we moved over from the tiny, old library on Thomas Street. I have been working in youth services for nearly all of those 7 years, but I just finished my master’s degree in library science, so I am officially a real librarian now! I’m excited to get to work in teen services, and will be running all of our great teen programs from here on out. I am already planning some super fun stuff for next summer, so make sure you check back and see what we have in store. To make all this introduction stuff a little bit easier, I threw together the graphic below with a few of my favorites included. I am obsessed with everything by Sarah J. Maas, my cats, coffee, and Lorde. If you guys have any questions for me, please include them in the comments below and I promise to try and answer! About: This free-verse biography with black-and-white watercolor illustrations depicts “Frankenstein’s” young author, Mary Shelley. Ofilia’s Thoughts: This year marks the 200th anniversary of the publication of Frankenstein so this biography of Mary Shelley comes at a perfect time. This is a gorgeous book that tells an ugly story. 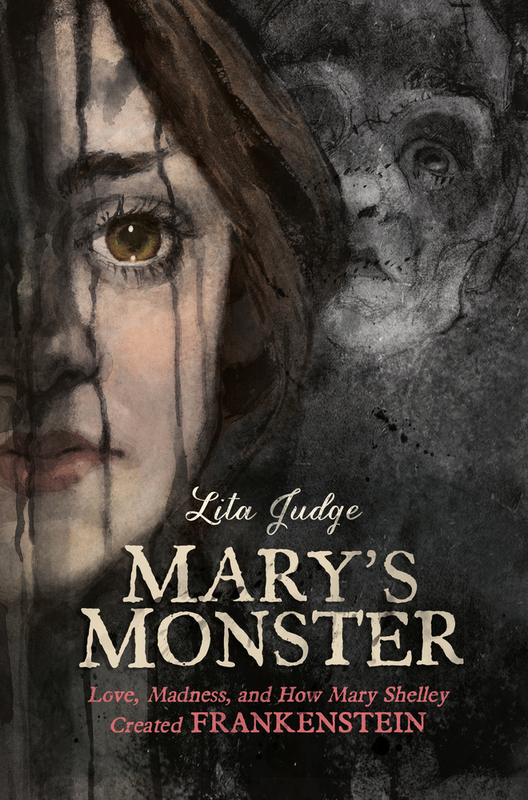 Fully illustrated, Judge uses poems to narrate the life of Mary Shelley. She met the promising poet, Percy Bysshe Shelley, at 16 and ran away with him. Soon she found herself unwed and pregnant while Shelley was cheating on her with her own stepsister. As if this wasn’t awful enough, her infant died at 10 days old because she was born premature. The sorrow doesn’t end there. Judge argues that the pain and misery that Shelley endured at such a young age is what gave her the basis for her famous literary monster. She recounts hardship after hardship all the while the monster seems to grow in the illustrations in the background. Sometimes fully present, sometimes hidden in a landscape or in the shape of a cloud that hints at something sinister. Even if you are not a fan of Frankenstein, you cannot help but feel for this young woman who is trying to make her way in a world that doesn’t value her or her talents. Judge also includes notes on her own process and on what happened to everyone mentioned in the book. A prefect eerie read as we approach the Halloween season. About: Seventeen-year-old Zélie, her older brother Tzain, and rogue princess Amari fight to restore magic to the land and activate a new generation of magi, but they are ruthlessly pursued by the crown prince, who believes the return of magic will mean the end of the monarchy. Ofilia’s Thoughts: This book has some outstanding things in it. It also has some not so great things about it. Firstly, the cover is stunning. Whoever designed it should get an award. The story is told from three different points of view, which is interesting. The world, based on Nigerian mythology, is rich and interesting. The most exciting part of the entire book is that all of the characters are black and that the two main female characters are intense warriors. When I started the book, I thought this was going to be the best thing ever! And then the middle happened. It dragged and so much of it was typical YA novel nonsense. Zelie, the main character makes the same mistakes and doesn’t seem to learn or grow at all. The chapters from Inan’s point of view (he’s the crown prince mentioned above) are basically the same chapter over and over. He is caught between two worlds and each chapter he vacillates his loyalty between one or the other. He is constantly switching sides and his lack of backbone despite everything is annoying. The romance between Zelie and Inan is forced and unbelievable. It took me out of the narrative completely. The only character that has clear growth and evolves is Amari. Her point of view seemed the most honest and genuine to me. She actually used her brain and not just her gut. The action picks up in the final scenes and it ends on a powerful note, but I’m not sure the middle of the book is worth the journey.